Waterford Crystal GLOBE with a solid wooden base. Would make a lovely gift or addition to your Waterford collection. 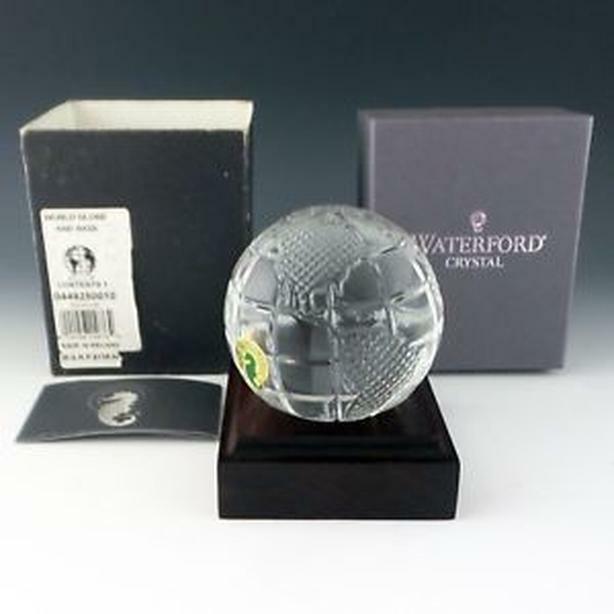 Presenting an exceptionally stylish and sophisticated cut crystal world globe shaped paperweight / display feature produced and signed by the quality Irish crystal makers Waterford Crystal. This fine example comes complete with its original stable wooden base which perfectly displays the sparkling crystal globe. This exquisite piece has been beautifully hand cut with faceted diamond point cuts adorning the land masses. Intersecting vertical and horizontal cuts surround the land masses, creating the lines of longitude and latitude. The cuts perfectly follow the sleekly rounded contour of the globular form. Very unique. Bought at the Waterford Crystal factory in Ireland and have never taken it out of the box or displayed it. Downsizing and sadly need to part with some collectibles.